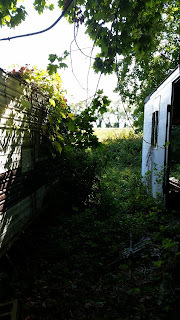 One evening, late, driving around the extremities of our county and edging into the unyielding farmland and fields encompassing our stretch of suburbia, we discovered another forgotten home, as we are wont to do. The area was one that we had covered countless times, but I was not as familiar with this side of the county. It was dark and, per the norm, the county highways bore no lighting. Out there, you could go miles surrounded by open field, and then spend just as much traveling time through dense patches of forests, dotted by the occasional rural homestead. We had decided to turn around within the next few miles (as we were obliviously lost and tend to go as far as we can without GPS assistance before turning towards home) when we were met with the stark uncanny feeling of simultaneous familiarity and foreign ignorance to our setting. I knew these roads, as did my traveling companion. She had even previously commented on a country club entrance we passed about an hour ago. But this was different -- we were within miles of our beloved Princeton, of Allentown, of the like. But I felt as if we were on another side of these communities. I felt like I had somehow passed Ironside II into some backwoods slice of rural Pennsylvania. We were bearing the identification documentation of the exact state of our current location, but felt years from our national origin, miles from familiarity, of comfort, of home. This peek into the absurd silently left me feeling odd and I resolved to finally turn around. So we pull into what I can only describe as a dilapidated conglomeration of a motel, laundromat, and American Legion banquet center. It was as if three equally-failing ventures were joined at the seams and no one was present. Through the large, unclean bay windows, a flickering fluorescent lamp painted the light blue scene even more dismally. A door hung open. I pulled into the narrow parking lot and followed to the back of the building, having not enough room to properly turn around. Outback, lumber and scrap were piled in a sorting order unknown to me. At the far end of the yard, before the black wood-line, sat a solitary gazebo. Was this some sort of home for the ill? The juxtaposition of a lovely garden park and... this did not sit well with me and further prompted our flight. We are driving silent sans the intermittently-failing radio on the narrow county roads when she grabs my arm and excitedly asks, "Did you see that?" 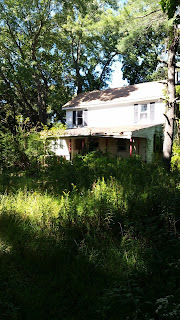 I did not and she told me that she saw one of our treasures, the surprise and previously unknown abandoned property. So I drive about another half mile until I can properly turn around and creep back towards the location. 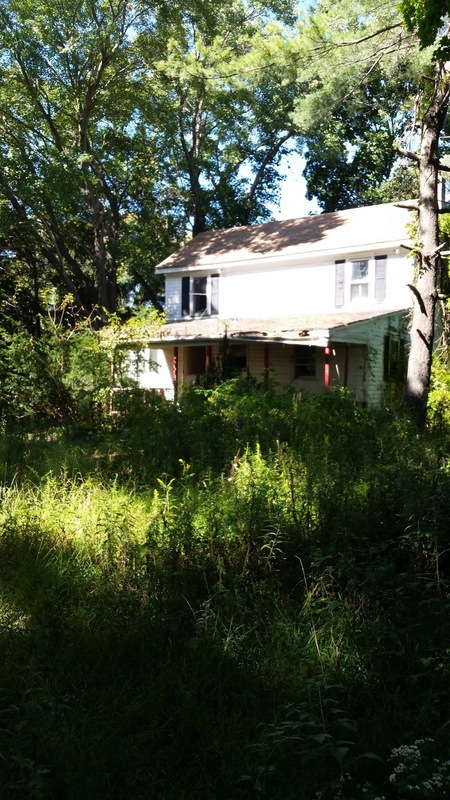 There she is: a seemingly vacant house bearing at least a few decades of existence, the screen covered door torn, a few windows broken, with any semblance of a lot grown to knee-high weeds and vegetation. I look at my companion and smile. We found gold, but the color of the night, as well as the time, told us that we should return with the light. The house itself, although beautiful, was surprisingly empty. 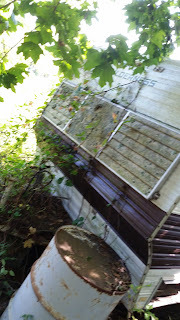 There were some corners of animal waste and mold throughout, but it was just a pretty two story home. The condition of the kitchen amenities surprised me, as well as the quality of the plain carpet throughout. These places usually hold an obscene level of mold and decay; not here. I recall finding a basement door, but I think upon opening it, the dampness and darkness swore us away. The backyard, for the most part, was pretty barren in its core. The borders were, of course, overgrown, and terminated in a treeline and open fields beyond. 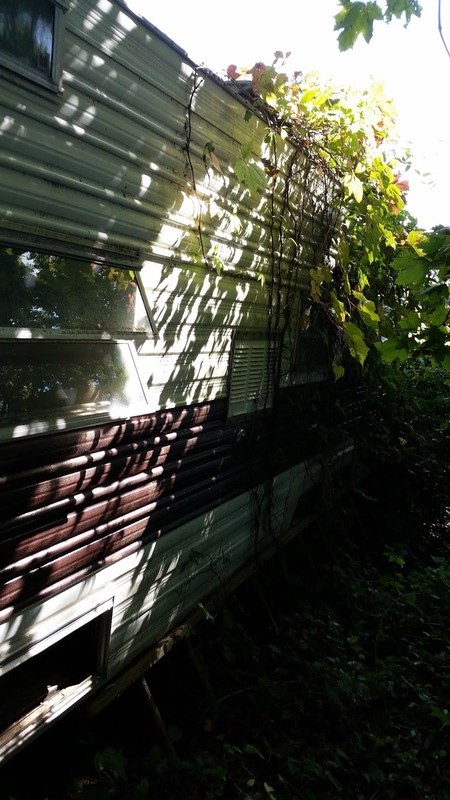 We discovered an old car, a RV, and a small chicken-coop / shed overgrown with vines. The RV was straight out of Breaking Bad and led to us endearingly deeming the location, "the Meth House" -- I took creative liberties with the naming of this article. Neither of the vehicles were accessible, but added to the horrifying aesthetic of the property. Further, we found a handful of separate animal bones in the shed area of the property, prompting the question of, "What kind of predator?" prowled the area. But this was not what prompted the Meth House into infamy for me. No. As we drove away, my traveling companion filled me in on a detail that would have dissuaded me from future visits. When she first glimpsed that property, she left me out on a crucial detail. 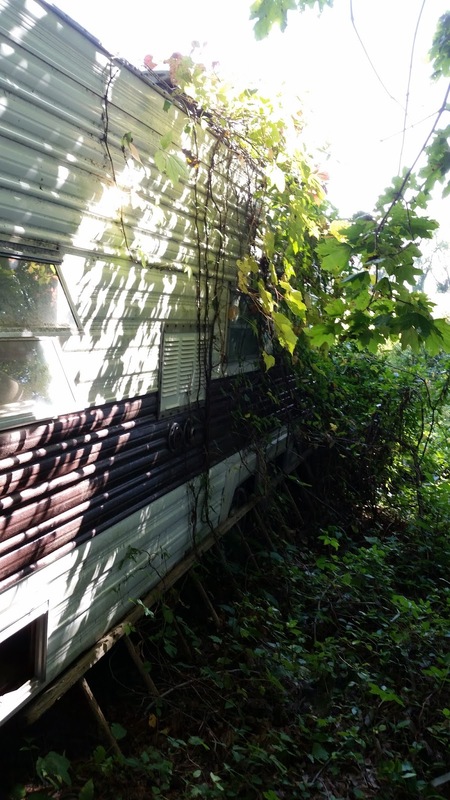 When we first passed the house, the screen door was torn, yes, but sealed shut. When we turned around that night, to get a second glance, it was quite ajar. Had I known that, perhaps I would not have been so quick to revisit the house frozen in vacancy.